Wild Poppies shawl – now available! 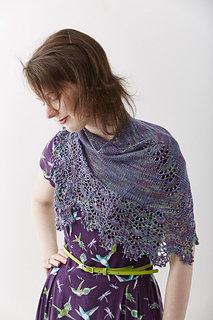 I have something really exciting to share with you today; a new shawl pattern! Meet Wild Poppies; the latest addition to my eBook ‘Wildflower: The Lace Collection‘. The petal pattern reminds me of the shape of poppy petals, hence the name! This one has been quite some time in the making, so I’m delighted that I finally have it ready to share with you. To celebrate the launch, there’s 20% off this pattern (no code needed) until the end of Monday (23.59 BST on Monday 13th July 2015). Wild Poppies features an unusual lace patterned spine and a border inspired by poppy petals; which you can bead as much or a little as you like. I’ve beaded the spine and the border in the purple variegated version (shown above) but in the red version (shown below) I’ve just added beads to the very edge. 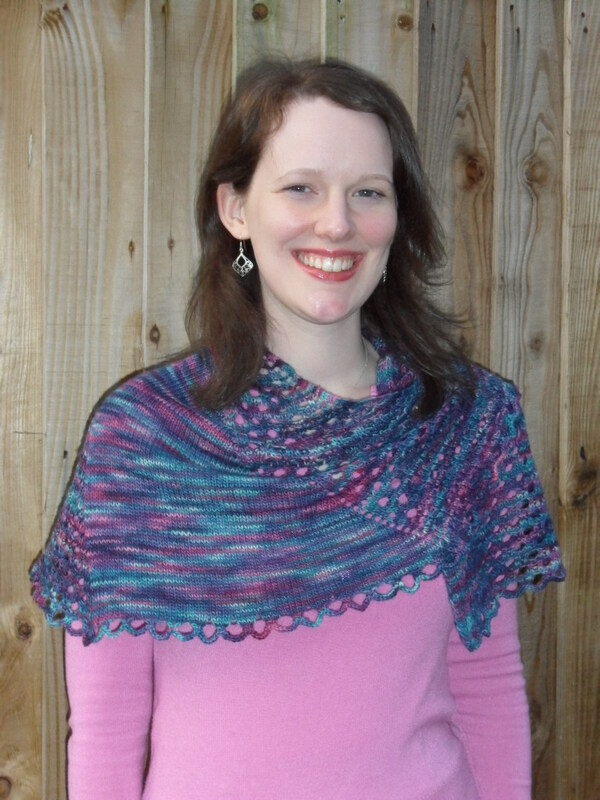 The pattern provides options for both versions so you can really make the shawl your own. I’ve designed this shawl to be knitted in just one skein of either heavy lace (lace weight yarn with around 600m/100g skein) or 4ply weight yarn (with around 400m/100g skein) and the lace pattern works well with solid or lightly variegated yarns so you can easily pick a favourite skein from your stash and make something pretty with it (if you’re anything like me then you’ll have quite a lot of single skeins to choose from). There’s also a handy table of estimated yarn and bead quantities in case you want to make a larger or smaller shawl. As usual with my patterns, all lace patterns have both charts and written instructions so you can work from whichever you prefer and the charts are provided on a separate page at the end of the pattern, so there’s no wasted paper if you don’t want to use them. So, why design this shawl? I loved the original border pattern I designed for my Rockrose Wrap so much I wanted to incorporate it into a heart shaped shawl, not just by adapting it into an expanding border pattern, but also using it to add interest to the increases at spine of the shawl as well, creating a softer, more flattering shape than a traditional triangular shawl. I’ve thought for a while that the design opportunities that the spine of a triangular shawl presents are to often ignored. Just because you have to work increases doesn’t mean they always have to be a straight line of yarn overs! Why not use a different increase or make a feature of it? It certainly makes the body of the shawl more fun and interesting to work! I think it’s one of the most beautiful things I’ve ever made, (even if I do say so myself) but I can’t claim all the credit, the beautiful yarn I used certainly helps; Posh Yarn Lorelei Sock (the purple variegated shawl) and Posh Yarn Valerie Heavy Lace (the red shawl). Unfortunately Valerie Heavy Lace is being discontinued, but Posh Yarn are having one last update with the yarn this Sunday at 7pm. If you miss out on that, their Diana Heavy Lace or Miranda Heavy Lace yarns would both make lovely substitutes. Thanks to Jeni from Fyberspates and the amazing Jesse Wild, who took these lovely photos of me and the shawl on their photoshoot earlier this year and also to my lovely test knitters. I’ve got another new design to tell you about today. Honestly, you spend three months working on new designs, and then they all come out at once! My latest design to be released is Denman, a shawl with an unusual construction in Artesano’s gorgeous new Linen Silk DK yarn. I wanted to design a shawl that was a little different from the others I’ve designed in the past, something more like a wrap which would stay on your shoulders easily and not slip off, with a stitch pattern that would show off variegated colourways but still be a bit different from the usual suspects (feather and fan, chevrons etc). I’ve been fascinated by Estonian style increases (where between three and nine – or sometimes more – stitches are made from just one stitch) for some time now, ever since I designed Cleome using them. I’d been experimenting with other ways of using them in my own original stitch patterns, so after some quite substantial swatching and a lot of frogging, I came up with a stitch resembling falling petals. I realised that I could use the same increases to work a circular shape. What would happen if this became the central section of a wrap…. with two sides radiating from it at an angle, like this? That would help it to stay securely on your shoulders! Of course, in order to test out this theory I had to knit one of the largest swatches I’ve ever knitted! It probably would have been even larger, but I ran out of yarn (this was the yarn I had left over from Tatyana – about 70g or so of Manos Silk Blend if I recall correctly). You will have to excuse the fact that it looks like a massive boiled sweet wrapper! Because of the way the pattern works, the circular section of this swatch had to be as big as that section in the real life shawl, otherwise I wouldn’t have been able to test out the pattern on each side of the shawl at the same time. Despite this idea being a bit mad and off the wall, Jenny at Artesano was able to see past the big sweet wrapper swatch to the sketch and commissioned my design! I was pretty chuffed, as I love working with Artesano and I also love doing more unusual designs – working it out is fun, but the sense of achievement when you realise that your mad idea actually works is even better ;). I was pretty excited when the yarn arrived. You never know which colour you are going to get for your design until it arrives, but I was absolutely delighted with the beautiful colour that I ended up with, #EX52/Paradise, a beautiful mix of blue, turquoise, pink and purple. It was perfect, both for the shawl and for me, as those are my favourite colours! The yarn (a DK weight mix of 40% Wool, 35% Silk and 25% Linen) was beautiful to knit with and I loved the way the linen added depth to the colours. Also the skeins were incredibly evenly matched even though they were hand dyed, which is very impressive (although I still decided to work the yarn in stripes from two skeins at a time in order to guard against pooling – I don’t think it would have been a particular problem, but when you’re working a large item to a deadline the last thing you want to have to do is frog your work, so I didn’t want to take any chances). 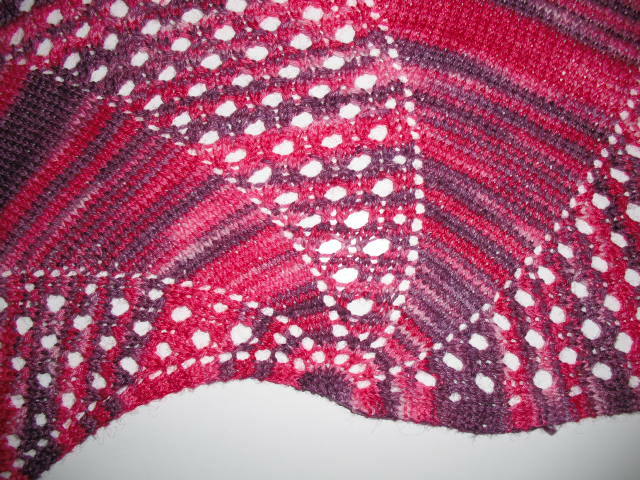 You can see more pictures of the finished wrap than I could possibly include here on my Ravelry project page. I’m delighted with the beautiful pictures Artesano have taken of this for the pattern photography. The colours are very true to life and almost glow, just as they do in the flesh. Thanks Jenny and the team! I’ve got another design to tell you about today, but first I just wanted to say thank you to everyone who followed, commented, liked or tweeted about my last-post-but-one, Barmouth. I was really overwhelmed by your heartwarming responses and I never expected such a big reaction, thank you! 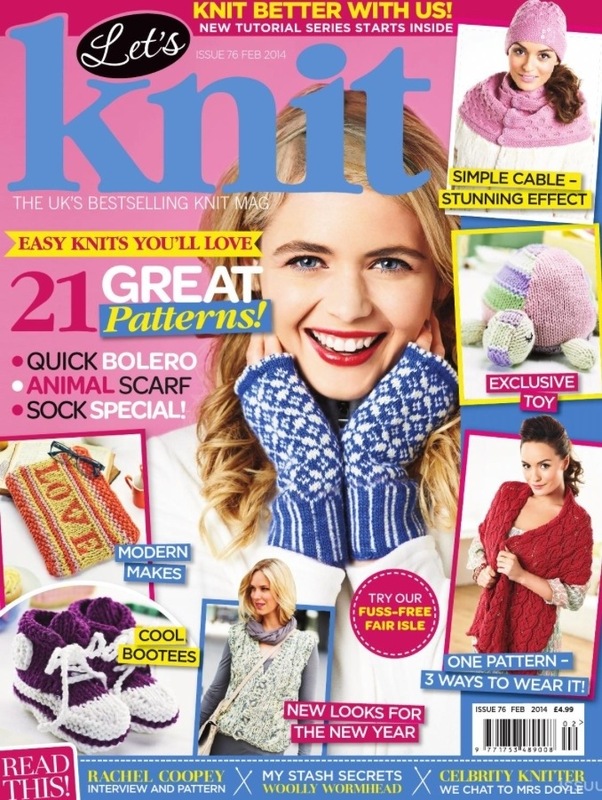 Siskin is published in the latest issue of Knit Now Magazine (out today!) as part of a collection inspired by the Arts and Crafts movement (you can see the rest of the collection and the mood board that inspired it on Pinterest here). My original inspiration for Siskin was the work of William Morris. I really love the use of flora and fauna in his patterns, such as the famous ‘Strawberry Thief’ print and I wanted to create my own original colour work pattern, using some of the key elements and characteristics of designs from the Arts and Crafts movement. The more you study various Arts and Crafts style repeating patterns and prints for wallpaper, fabrics, tiles etc, the more you begin to notice recurring themes, such as the use of motifs from the natural world (birds and flowering plants especially), mirroring and hourglass shapes. After absorbing all these different inspirations and leaving them to ‘brew’ for a bit in my head, I got to work with Stitch Mastery, charting out a repeating pattern through trial and error. I really enjoy this stage of designing stranded colour work patterns, when you’re really inspired by something it just flows and is very satisfying, just like the endless drawing I used to do as a child. This swatch was knitted in Fyberspates Vivacious 4ply in Tweed Imps (for the background) and Fyberspates Scrumptious 4ply in Oyster (for the birds pattern). I wanted to use a subtly variegated yarn for the background to allow me to use all the rich colours popular in Arts and Crafts designs, without introducing too many different yarns and give the pattern depth. But what to do with the colour work pattern? My original idea had been to use it for a small crescent-shaped shawl, but that would be a bit of a faff working to a tight deadline, so I settled on a tablet/e-Reader cosy, just the right size for a Kindle or iPad Mini. Of course it didn’t end up as a tablet case did it? Kate from Knit now emailed me to tell me that she would like my design to be in the magazine, but that they had rather a lot of tablet cosy designs…. could I make it into a hat perhaps? I panicked for a weekend while I worked out what to do. The pattern repeat was big, I knew the shaping would probably end up interrupting the pattern messily and that grading it for three adult sizes would be impossible. But I really wanted to accept the commission, because I was excited about the design. What to do? Being a glutton for punishment and not good at saying no to offers of work I decided to offer a couple of alternatives. A cushion, or a little crescent shawl (my original, rather ambitious plan) perhaps? Kate replied that either would be fine so I could choose. So I chose the crescent shawl, because I really wanted to make it! In due course, the yarn was chosen and sent out to me, (Manos Del Uruguay Silk Blend Fino in Lava #6921 for the background and Topaz #2220 for the birds pattern) and I got to work. I had a panic about the amount of work I had to do in the time available (with Christmas slap bang in the middle) and got started! After a lot of late nights and only Christmas Day off from the long rows of fairisle, I finished knitting the shawl! Yay! …..it’s just as neat on the back too (I always stranded the background colour above the birds pattern colour – this makes the stitches for the birds pattern very slightly longer and gives it more impact – doing this consistently throughout the whole piece keeps the knitting neat on the right and wrong sides of the work) making the wrong side look almost like a tapestry. Tian – A rather unusual design story! At the end of the post I mentioned that Marvin might be involved in the rather daft design story behind these mittens. Perplexed? Well, prepare to be less perplexed (and quite possibly think I’m completely mad). I made him about a year ago, after my brother bought me a particularly amusing knitting book for Christmas called ‘Knitted Meerkats’ by Sue Stratford (if you click that link and look at the projects on Ravelry you’ll see that Marvin has many little knitted cousins around the world). Anyway, meerkats are desert creatures, used to warmer climes than chilly, wet and generally dismal Britain in winter, so Marvin was clearly going to need something to wear. I wanted to put a snowflake on the front, but the area to play with was too small, so I charted out the size of the original sweater and fiddled about with the stitches until I had something I liked. I had to alter the shape of the sweater quite a lot to make it fit, as the stranded pattern changed the tension compared to the original. 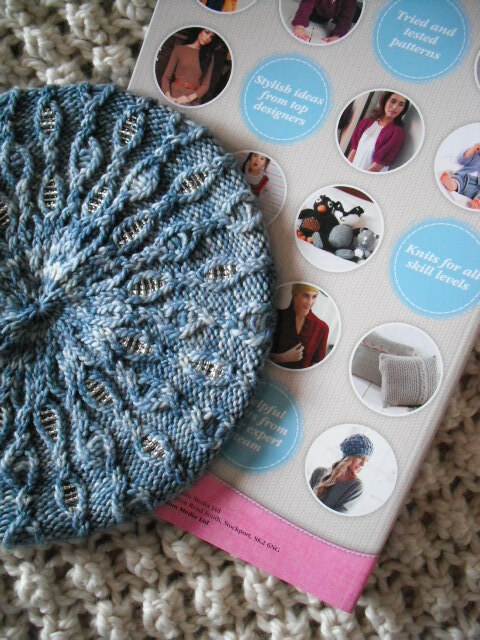 I sent it off to Sarah at Let’s Knit and she liked it! Before I knew it my first choice of yarn (and a personal favourite), Manos Del Uruguay Fino (70% wool, 30% silk) in #2440 Lapis and #2800 Cream had arrived, so last summer I got started and knitted them up! Yes, I am still doing a happy dance. Happy Knitting lovely blog followers! I’ve got a design on the front cover of a magazine! Look, these are my blue and white fairisle mittens! 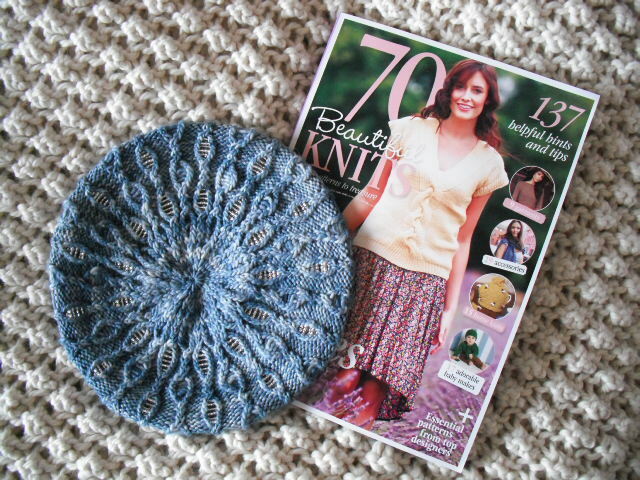 This is the latest issue of Let’s Knit! Magazine (Issue 76) out tomorrow (I can’t wait to go and get a copy!) and there is a rather interesting (if slightly daft) design story behind them, but you’ll have to wait until tomorrow for that! The mittens are called Tian and you can see them on Ravelry here. I can’t believe my mittens are the cover picture, I’ve had small pictures of my designs on magazine covers before, which is always pretty exciting, but never as the main picture and I love the photos (more pics tomorrow). If I had more energy this evening I’d be bouncing off the walls! Sorry for the lack of posts recently, I am still here, I’ve not dropped off the face of the earth, just been really, really busy (up until half two in the morning knitting big fairisle sample/lace and cable sample/trying to get a pattern tested/doing tax return kind of busy). And by the weekend I will be again! Don’t get me wrong, busy is good, but busy is also tiring and lacking in social contact (both in person and online) and it makes you feel guilty for not working (even on Christmas Day – I am my own worst boss), so I’m sorry I’ve been off the radar for over a month! I hope you all had a good holiday season and I’m looking forward to catching up on all your blogs! More tomorrow (Marvin my be involved in the daft design story – if you can guess how, you can have a little prize from my stash 😉 )! Exciting news! I have a pattern in the latest issue of Let’s Knit, out today (Friday 15th November)! These are my Echo mitts knitted in Manos Del Uruguay Fino (my favourite, I’ve used it so many times and I really love knitting with it) and Rowan Kidsilk Haze (another yarn I keep coming back to). Like many good ideas, these mitts came from another idea that didn’t work as well as I’d hoped. I’d had the Manos Fino left over from Cleome and I’d bought one ball of Kidsilk Haze with the intention of combining it with another yarn. I had intended to swatch for some ruched mittens and picked these yarns out simply because they happened to be near to each other in a rather disorganised section of my stash and I noticed how well they co-ordinated with each other (unusual for two yarns from different manufacturers, as each brand tends to have it’s own colour palette – Debbie Bliss yarns for example often include a duck egg blue in their colour range and Rowan tend to have fewer very bright colours than other brands, Louisa Harding yarns also tend to have a very distinctive palette which crops up across her whole range). The ruched idea didn’t really work and just looked a mess, but I liked the contrast between the textures of the yarns, so I undid the swatch and started again, working broad stripes (without ruching this time) and a pretty lacy scalloped edging. I didn’t really plan the design before swatching, instead just going with whichever design elements I liked best. Sometimes I think this is when you design best, when the ideas just flow on to your needles without thinking too hard or overanalysing what works and what doesn’t. Sometimes you just know if you’re happy with it or not. Once they had been commissioned all that was left was to knit them up (while watching Father Ted on 4od, which kept me sane as I didn’t have very long to make them – but then it’s easy to look sane compared to most of the characters) and write up the pattern – not much if you say it quickly! It’s been a little while since I made these, but it’s really nice to see them professionally photographed 🙂 I can’t wait to get the sample back, so I can wear them. They’re really comfy to wear, incredibly light but really warm because the mohair in the Kidsilk Haze traps the heat despite it’s sheer appearance. If you fancy making a pair they don’t take very much yarn, I used less than half a skein of each, so you could easily make two pairs from a skein of each yarn, or use left overs of plain 4ply yarn and laceweight in either coordinating or contrasting colours. They’d look great in black and white – or how about using Rowan Kidsilk Haze Eclipse or Debbie Bliss Party Angel (both of which have a bit of sparkle) instead of Rowan Kidsilk Haze for a more glamourous look? … I’ve been a bit quiet on here recently, but for good reason. I’m working on another new design at the moment and swatching, charting and sketching a few others in my spare moments (not many of those at right now) before I forget them. That’s the trouble with ideas. Sometimes one idea will turn out to be a jumping off point for several others and before you know it you have too many ideas to knit. I always seem to get the best ideas when I don’t have the time to take them any further, but if I jot them down now, hopefully I can pick them up again when I have some time. Before I go any further, I’d just like to thank you for your kind comments on my swirl shawl that I showed you last time 🙂 I’m so glad you liked it and I love reading your comments! If you’re looking out for it this picture might help (hat not included)! You can get the bookazine on the publisher’s website here and in larger newsagents in the UK. 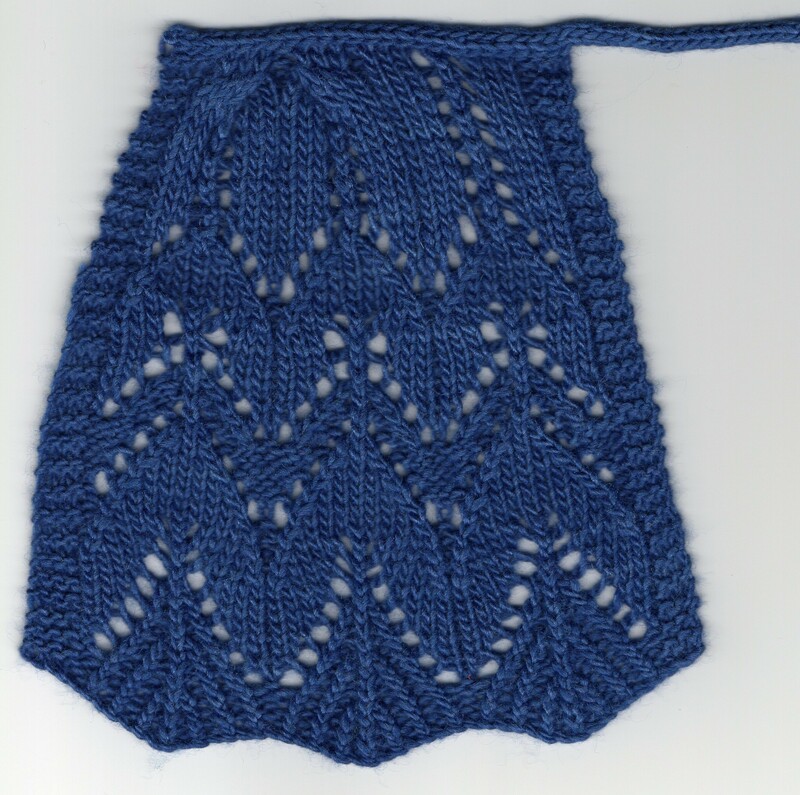 I will, at some point self publish Glacier on Ravelry, as I now have the rights to the pattern back, as well as the sample. I’m not quite sure when this might be though, as I need to re-make the sample in a colour that makes me look less like a corpse (I’m too pale to wear this shade of blue, much as I like it and unless you know any willing models, muggins here will have to attempt to strike a pose)! I’m also contemplating another matching accessory pattern to go with it (a shawl/shawlette/scarf perhaps?) to sell as an eBook as well as selling the patterns individually (the eBook would be priced cheaper than buying the individual patterns) – what do you think? I’ve not done much self publishing before, so I’d really appreciate your views! What do you like to see in downloadable patterns? Let me know! I enjoyed making it so much I’ve already made another to keep for myself, but more about that when I get some decent photos (I’m waiting for the weather to pick up a bit). The trouble is that when it’s too hot, by the time I get home I feel about as motivated to get changed and have my photo taken as I used to about English Literature at school. I hated English Literature. To me it just seemed the most pointless subject known to man. (Can you tell I have a science brain?) I like facts, stuff with evidence behind it that you can be pretty certain about, like physics (I can still remember the names of all six quarks – up, down, charm, strange, top and bottom – in case you’re wondering) although if someone reads that in 100 years, new physics will have been discovered at CERN and it might all be wrong. I like arty stuff too, but English Literature just seems like speculation to me. Read a poem/book/etc. Try to figure out what the author really meant by all of it. If it’s a historical text, the author isn’t around any more to check. What if they wrote a poem about a dog and you think it might be about the futility of existence, but they really just wrote about their dog, with no hidden meaning at all. Isn’t it arrogant to assume that we know what they meant, what they were thinking? Sometimes I want to get a poem into a school anthology just so someone can analyse it, find the ‘hidden meaning’ and then I can prove them wrong. Or give it a subtext on the futility of English Literature. I’m rambling again. I must stop doing that. But today it has been slightly less hot and more bearable, so I have photos! This was originally my swatch for Swirl but it seemed a shame to waste the yarn (Easyknits Biffle-Boo which I bought at Andyfest last August) so after my submission had been accepted by Let’s Knit and I had finished the sample, I undid the cast off on my swatch and just kept knitting until I ran out of yarn (it’s the sort of shawl where you can pretty much do that). The only difference between this and the sample in the magazine is the edging. I nearly ran out of yarn so I had to cast off a row early – on the same row where you work the edging – which is not ideal, but I wanted to use every inch of yarn I had! This yarn is lovely to knit with and I love the colours – which is the reason I bought it in the first place! I was worried that I wouldn’t have anything quite the right shade of pink/red or purple to wear with it for the pictures but then I remembered this dress and luckily it was the right colour. 🙂 I’m really pleased with it and I’m sure I’ll wear it a lot once the weather is cooler. It’s rare for me to actually get a chance to make one of my designs to keep for myself so to have made this feels like a nice treat! Last week I showed you Swirl and promised you a post all about it, so I’m keeping to my word! I really love the styling in this photo! But enough of that. You want to know the design ‘story’ behind the shawl. I wanted to create a shawl that would work really well with all those pretty variegated yarns that really call to you in the skein, but once you get them home are difficult to find a pattern for. Obviously you could knit variegated yarn up to any pattern you like, but an intricate lace pattern or detailed cabling would be lost in a highly variegated yarn and all your hard work in knitting something complex would be for nothing. Just one teeny problem. 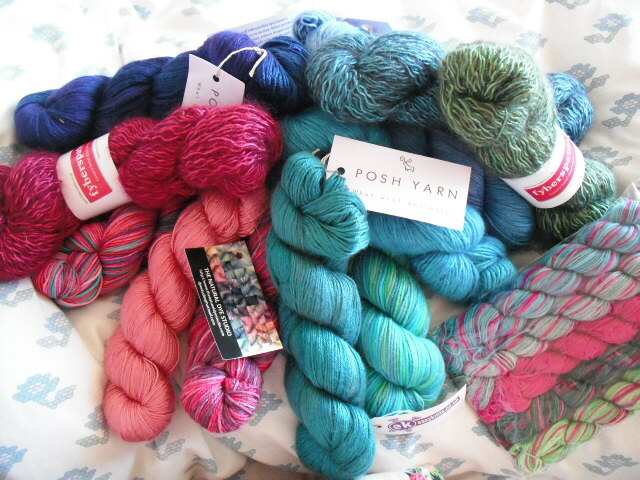 I love variegated yarns, and have many in my stash. I also like more complex interesting patterns. They say that all designs start with a problem that needs a solution (although I’m sure there would be a more eloquent way of phrasing that) and that was my problem. Most of the stitch patterns that I swatch in variegated yarn just give me that little niggle in the back of my head that says ‘it’s ok, but it would look better in a solid colour’. It’s rare that I think a stitch pattern looks just as good in a variegated yarn as it does in a plain one. So I really needed to find the exception to prove the rule! So I had a look through my stash to find the most variegated yarn I had, one with lots of contrast, the sort of yarn that screams ‘If it works in this, it will work with ANY variegated yarn!’ and I came up with a gorgeous skein of Easyknits Biffle-Boo that I bought at Andyfest/Bluefaced Open Weekend last year (such a lovely day out, and such a lot of nice yarn – I did of course buy far too much!). 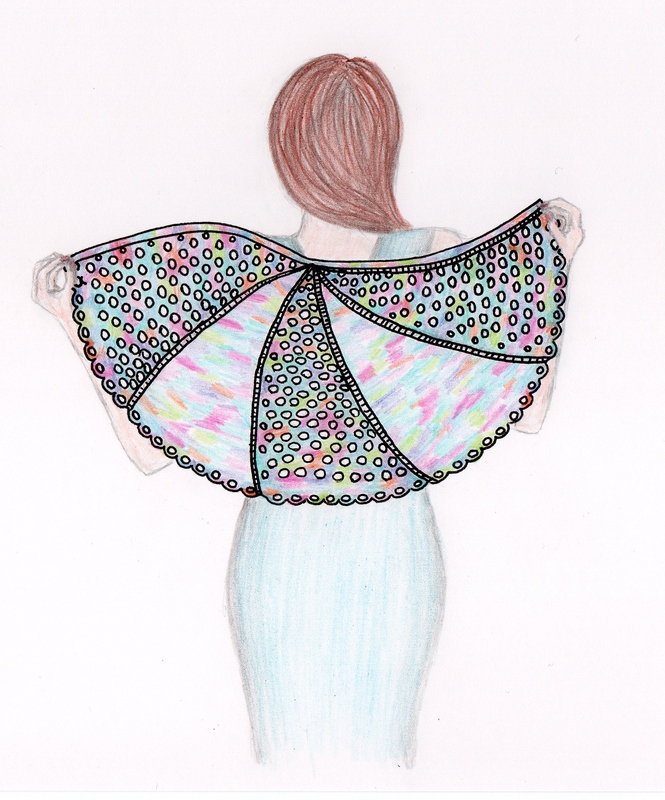 Then I thought about the usual shawl shapes, and whether there was something a little different I could do. There are so many beautiful shawl patterns out there, mostly triangular or crescent shaped, but as my stitch pattern would have to be quite simple I thought it needed a shape that would add extra interest. After all, as long as you have the right number of increases every row, you can put them wherever you want! Large eyelets, for lots of contrast with the stocking stitch sections and an asymmetrical swirl shape for something more unusual! Plus the swirl shape is easy to wear around your shoulders without it slipping off. 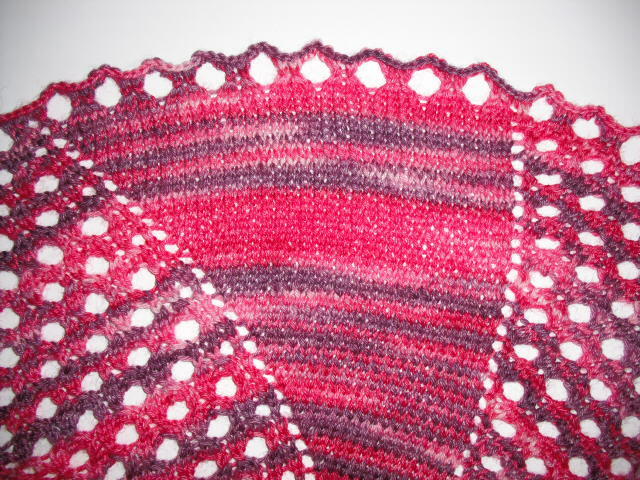 Once the shawl had been accepted I had to choose a more widely available yarn for my design. This wasn’t difficult – I have a bit of a weakness for Manos Fino (a 4ply version of their popular Silk Blend yarn) and that comes in some pretty variegated colours, so we chose #6881/Jewel, a pretty mix of blue, turquoise, pink and purple. And here is the finished article 😀 I’m so pleased with how it turned out! Rubbish model though! I enjoyed making it so much I’ve already made another to keep for myself, but more about that when I get some decent photos (I’m waiting for the weather to pick up a bit). I’m lucky enough to have a design in the latest issue of Knit Now Magazine (Issue 21, which is out today)! I love the photos! 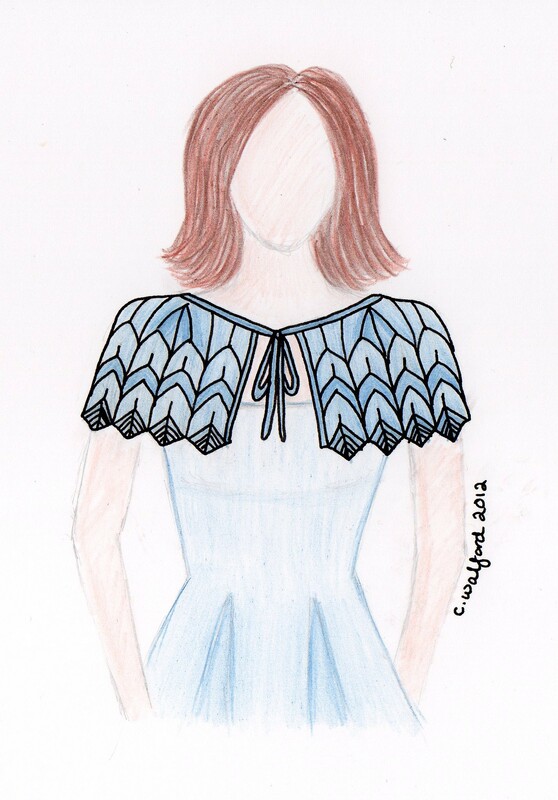 They are styled exactly as I imagined when I designed the capelet. 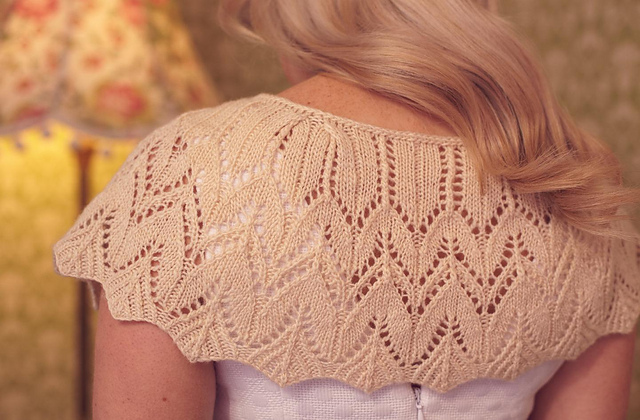 Avocetta is a pretty little capelet featuring twisted stitches, lace with integrated shaping, pleats and i-cord ties incorporated into an i-cord cast off. It’s sized to fit UK size 8 – 26 and only uses 100g of Manos Del Uruguay Fino for all sizes (I loved using this yarn for Cleome, so I was excited to have a second opportunity to use it). But enough of all that – you want to know how it was designed! The theme for this particular issue was Tea Dance, which immediately got me thinking of pretty, feminine things, lace, full-skirted dresses and things to wear with them. With this in mind I got to thinking about capelets. I wanted something with an edge that wasn’t straight, but I still wanted it to look delicate. I didn’t want the edge itself to be too lacy though, as I wanted it to hold its shape. I kept thinking about all these things until they crystallised a little more. Then I started thinking about birds and their feathers. I chose twisted stitches for the edge of the capelet and then a succession of feather shaped lace patterns gradually decreasing towards the top of the swatch. Thinking about the shaping of those full-skirted dresses, I added pleats at the top of the swatch. I wanted to add an i-cord to tie it around your shoulders, but I thought a neater solution was required. Why not run the i-cord ties into an i-cord cast off? That would make the top edge nice and neat, with no fiddly ribbons to lose and best of all….. no finishing!! Now you can see why I’m so pleased with the styling and photos – it really is just as I imagined! Rockrose – now available as a scarf! Get Lottieknits updates via Email! Enter your email address to follow Lottieknits and receive notifications of new posts by email. All text and images are Copyright Charlotte Walford 2012 - 2014 unless otherwise stated. You may not use, reproduce or distribute them for any purpose unless you have prior written permission from the copyright holder.